Now you can see everything. 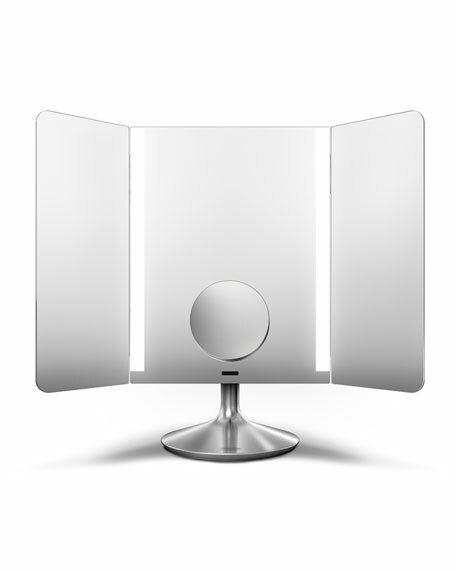 The Sensor Mirror Pro Wide-View from simplehuman provides a wide viewing area with adjustable side panels that let you comfortably see your face at any angle. This Pro model includes a smaller detachable 10x detail mirror for when you need to see up close. The mirror's tru-lux light system simulates natural sunlight, enabling you to see full color variation. The mirror's LEDs light up automatically as your face approaches and turn off when you are done. Tru-lux Light Sytem: Under the wrong lighting, makeup colors can fool you. 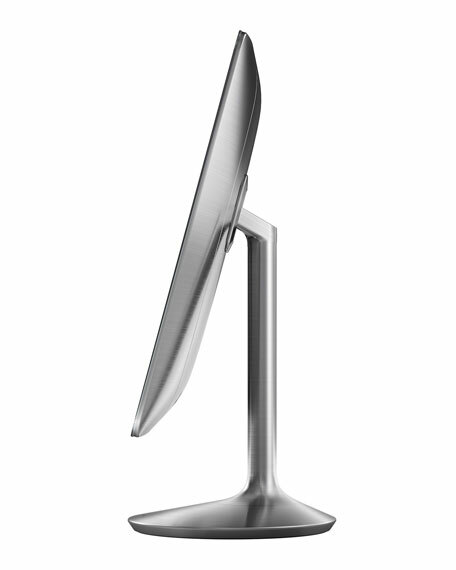 simplehuman's cutting-edge LEDs simulate natural sunlight for the brightest, most color-correct view. Dynamic sensing: The mirror lights up automatically as your face approaches and sensitivity increases during use so the mirror won't turn off unexpectedly. Confidence at any angle: A wide viewing area and folding side panels allow you to make sure you look great at any angle. 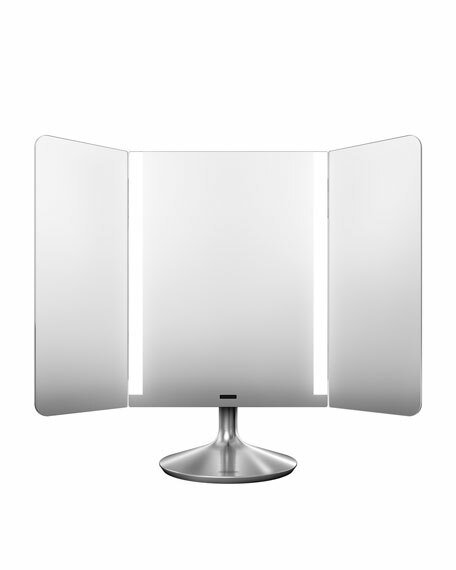 Magnification: Non-magnified main light panels with magnetically attachable 10x detail mirror for when you need to see up close. Never change a bulb: The mirror's LEDs are rated to perform like new after 40,000 hours; that's an hour a day, every day, for more than 100 years. Cordless and Clutter-free: No cord required during use (USB cable and adapter included for recharging). 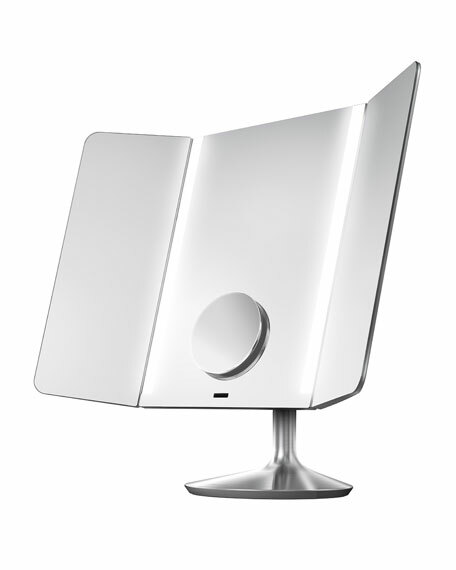 Rechargeable: Mirror can operate for up to 3 weeks on a single charge. Change the mirrors lighting by choosing from a selection of pre-set light settings or create your own setting to match lighting from your own office, favorite restaurant, gym, etc. Adjust brightness or set to auto brightness. 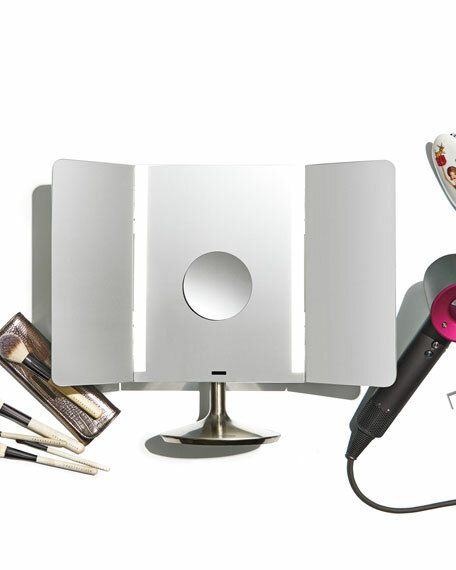 Help manage your makeup routine with a soft alarm or timer. Control the length of time your mirror's LED's will stay on.